22 year-old winner of Nigerian Idol 2013, Moses Obi-Adigwe finally makes his long-awaited and hugely anticipated debut with not one, but three excellent new singles ‘Love Is In The Air’, ‘Number One’ and ‘Love Letter’ featuring Eva Alordiah, for our listening pleasure. Fresh from winning the third annual number Nigerian Idol competition with judges Femi Kuti, Yinka Davies and Jeffrey Daniel all full of praise and critical acclaim for Moses, the Delta State native and first ever male winner of Nigerian Idol has been locked in the studio crafting some excellent records with acclaimed producers DJ Klem and Olaitan Dada, the results of which are these resoundingly captivating and infectious singles from Moses! ‘Love Is In The Air’, produced by DJ Klem is a fresh and bubbly dance tune that is just right for the summer time with its mash-up of lush drum patters and electronic arrangements. 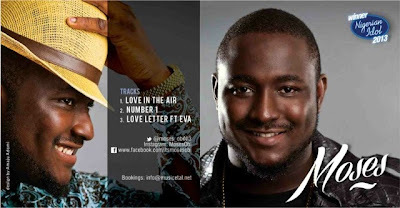 ‘Number One’ which is also produced by DJ Klem sees Moses showcasing his smoother and sultry side over the slow-to-mid tempo jazzy salsa number and completing the trio of new music from the Nigerian Idol winner and University of Benin is none other than ‘Love Letter’ which features the one and only Eva Alordiah and is produced by Olaitan Dada. With all three singles showing a completely different and exciting side to Moses, ‘Love Is In The Air’, ‘Number One’ and ‘Love Letter’ will do amazingly, not only to appeal to the fans he garnered from his winning performances on Nigerian Idol but also to win over new audiences and fans in Nigeria and across Africa.